At Body Innovations, we want to ensure that you are effectively and efficiently working towards your goals. That is why we offer both group and private sessions. The link between brain health and exercise has always been one of Susan Nash’s biggest interests. Her own journey recovering from a terrible car accident that left her with two fractures to the skull, whiplash, concussion, and memory loss pushed her to find a way to navigate her way to better health. Brain Gym refers to the system of 26 movements that are used to stimulate brain function and enhance areas such as concentration, focus, memory, physical coordination and organizational skills. Fascia is a specialized system within the body that resembles a spider web. In its healthy state, the fascia is relaxed and wavy and is one continuous densely woven structure existing head to toe surrounding and encompassing all muscles, bone, nerve, artery, veins and organs. It has the ability to move and lengthen freely and thus plays an important role in structure and function of the body. Fascia can lose its integrity due to physical trauma, causing it to tighten and bunch up and ultimately affecting the entire fascia system. Events in our lives such as car accidents, surgeries, poor posture and repetitive strain can cause the fascia to seize up, causing intense pain and discomfort. When fascia becomes tight, range of motion is restricted in the joints and this will decrease flexibility and stability. As motion becomes restricted, pain patterns develop and optimal health suffers. Fascial Stretch Therapy increases the flexibility of the muscles and fascia which increases the range of motion in the joints allowing for freedom of movement and dissipation of pain caused by tight fascia. This therapy may be performed on the floor or most commonly on the massage table. Self-regulated fascia stretching techniques are taught in a class setting or private sessions allowing clients to work at home to improve their flexibility and overall health. Whether you are looking for personal training or one-on-one Pilates training, these 60 minute sessions are personalized and tailored to meet your needs and goals. This package includes four one-hour private sessions that include an in-depth assessment of your range of motion, flexibility and functional movement testing (i.e. bending, twisting, lunge, squat, hinge and gait). Corrective stretches and exercises are provided which help to bring the posture into a more ideal position and may help eliminate biomechanical stress on the body reducing aches and pains. An at home program is included. 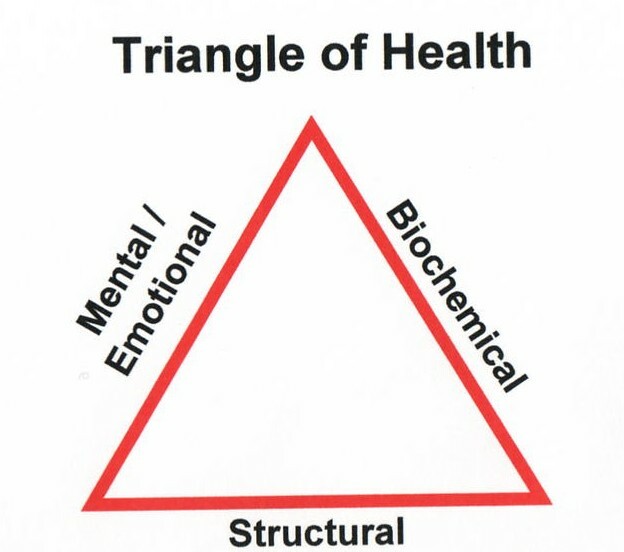 Touch for Health (TFH) can best be explained by the concept of the Triangle of Health. This is a holistic approach which presents the Mental/Emotional, Structural and Biochemical aspects of our being as equal entities in the triangle of health. When the triangle is equilateral the sides are balanced and the person feels well. But our bodies are constantly using our senses to adapt to known or perceived threats and the triangle is constantly fluctuating distorting the triangle. For example, if a person is under significant emotional stress, the triangle will become negatively distorted which will impact both the biochemical and structural aspects of the person’s health. Physiologically the nervous system and the endocrine system will take the brunt of the emotional stress. As the stress continues, the person will start to feel structural tension in their muscles/joints and may ultimately encounter digestive and vital organ trouble. TFH was developed by Dr. George Goodheart by adapting concepts from both Western and Eastern medical philosophies. Dr. Chapman found that he could stimulate nerve and lymph flow to individual organs and glands by applying pressure on the reflex points in the abdomen, along the sternum, ribs, back of the neck, crest of pelvis, behind the knees and the outside of the upper thigh. Chapman used his work to improve the body’s function and self-regulating abilities which overall helps all body systems to come into balance and maintain optimal health. TFH is a noninvasive holistic approach to improving health and well-being and it suitable for people of all ages to learn.